With the detonation of the first atomic bombs in 1945, North Americans faced the frightening possibility of a nuclear disaster. Lethbridge was not considered a direct target area, but the city prepared for nuclear fallout (radioactive contamination) if more influential centres like Edmonton, Calgary or American cities were hit. National and local officials produced literature meant to help individuals and families survive a disaster. Some pamphlets shared facts about nuclear fallout and the effects of a nuclear explosion. Others showed how to build an underground fallout shelter with thick dirt walls to block out harmful radiation—or a basement shelter if there was no time to flee to a safe zone. Pamphlets also offered tips for packing survival kits that would last up to two weeks. Checklists included both practical necessities, such as food, water, or blankets; and materials to help stave off the boredom of isolation in a fall-out shelter. In addition to preparing at home, children and youth were encouraged to join in civil defence training. During the summer of 1960, teens from across Canada were invited to Arnprior, Ontario, to participate in a youth-centered civil defence training program. Only six Albertans were chosen for this opportunity, including 18-year-old Marjorie E. Houghton, an LCI student from Lethbridge. 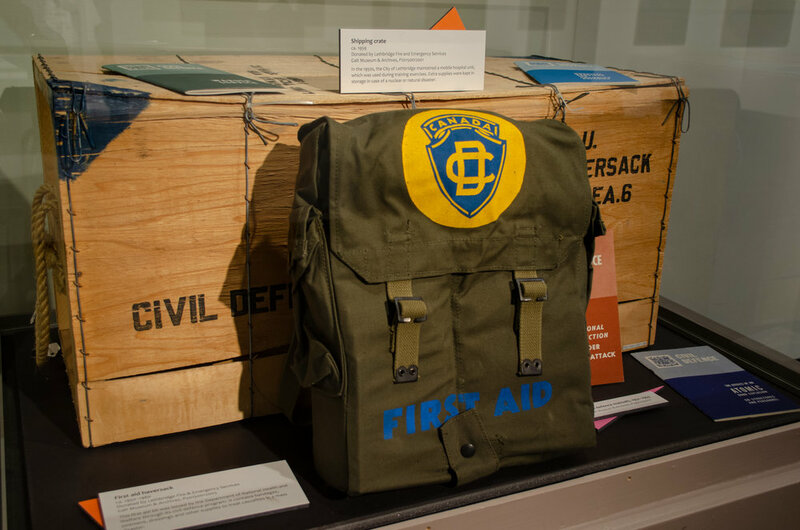 You can learn more about civil defence initiatives in Lethbridge in the new exhibit On Guard, Lethbridge! on display at the Galt Museum & Archives until February 11, 2019.